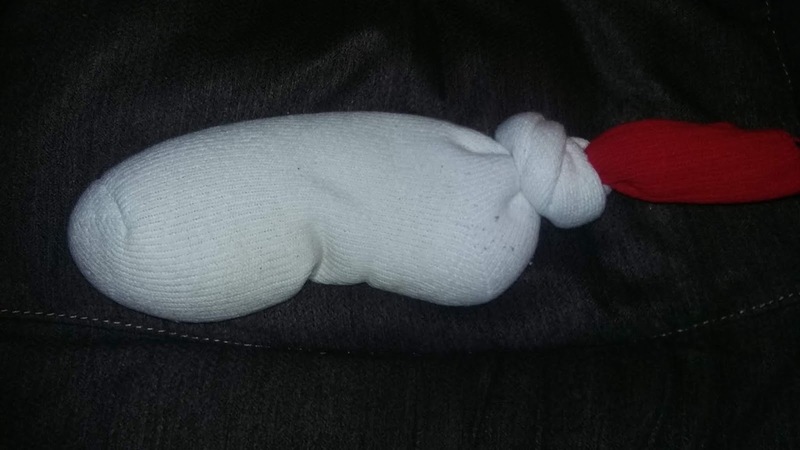 My dad gave me a bag of socks he isn't able to wear any more and, when I noticed there were a couple pair that were thicker (meaning I won't wear them because I'd never be able to get my foot in my shoe), I decided to turn them into heating pads for the family. This is a simple project. All you need to do is put uncooked rice (I used about four cups per sock) in the socks and tie off the open end. Then, when you want a heating pad, you put the sock in the microwave for 2 1/2 to 3 minutes. This works really well too because the rice/sock holds in the heat for quite some time. I put mine in the microwave for about 2 1/2 minutes before bed last night so I could have it down by my feet. When I woke up during the night, about 2 hours later, it was still warm. When I've made a similar one, in the past, for my wife, she was able to use it for everything from staying warm to helping her with a sore back or cramps. Yes, these can be re-used. The last one I made (for my wife and using a thinner sock) lasted about a year before the rice was getting burned to the point it wasn't as effective and a bit smelly. So, I would recommend this if you have some spare socks and want a fun family project.